Contact: Dr. Aston Goldsworthy, D.C.
A local Chiropractic office makes the adjustment in adding a wide variety of new medical services. Blue Springs, MO, June 28, 2010: Blue Springs Chiropractic Health Center announces the launch of several new medical-related service offerings. At their state-of-the-art facility on Main St. in downtown Blue Springs, the father-son chiropractors excel at being able to understand and treat a wide variety of patient needs. To learn more about the Doctors, staff or any of the service offerings at Blue Springs Chiropractic Health Center, please visit www.bluespringschiro.com or call 816.229.1941. BLUE SPRINGS, Mo. – Mayor Carson Ross is proud to announce that the 2010 Missouri Municipal League Westgate Division’s recipient of the “Civic Leadership Award” was Blue Springs residents, Reverend Doctor Ed “Doc” Golden. Golden was honored at the Missouri Municipal League’s Civic Leadership Awards Dinner on Thursday, July 15, 2010 at the Gladstone Community Center in Gladstone, Missouri. Ed currently serves as Chaplain for the Blue Springs Police Department and Inter-City Fire Protection District in Kansas City. He is also the Volunteers In Police Service volunteer supervisor, managing the day to day operation of the program under the guidance of the Crime Prevention Supervisor. Golden is the founder of the Community and Youth Outreach Unit (CYOU) Scholarship that awards college scholarships to Unit graduates. Ed has been a constant supporter, mentor and volunteer with the CYOU since 1994. Ed was awarded the Lifetime Presidential Volunteer Service Award for more than 4,000 hours of volunteer service in 2009. Golden is the Founder and President of Celebration of Life Counseling & Consulting. He has been published in magazines, and other periodicals on Personal and Spiritual Development, Motivation and Goal Achievement, Addiction Recovery, Family and Marriage issues, in articles, poetry, programs, and books. Current works include, "From Skid Row To The Front Row, or When Drugs And Poverty Stop Working". Ed is also the CEO and Chairman of the Board for Operation Thermal Reunion, Inc., a not for profit organization that hosts charity golf tournaments to raise funds to purchase Thermal Imaging cameras for fire fighters. Blue Springs Police Department Mission Possible! 1st BSPD Youth Academy Class Graduates! Mayor Ross recognizes good Detective work! to help make hotel and motel properties safer. 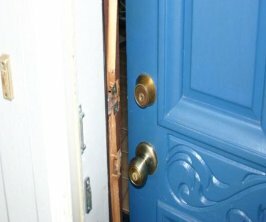 Door damage can occur in a motel burglary. BSPD's Crime Prevention Unit has introduced the Crime-Free Hotel/Motel program, a complementary program to the Crime-Free Multi-housing program. We are very excited to offer this program that specifically addresses the safety needs of the many hotels and motel properties in Blue Springs that have different crime prevention needs than other businesses. Crime Prevention Officer Doug Heishman has the direct responsibility for oversight of this program, and is ready and able to assist area property managers in making their property safe. The Hotel/Motel program includes a four hour training class provided to owners, managers, and employees of the hotel. Class topics include crime prevention through environmental design (C.P.T.E.D. ), drug identification, registration processes, combating crime, and liability issues. Prior to certification as a Crime-Free property, an officer from the BSPD Crime Prevention Unit inspects the property to ensure minimum requirements are met. 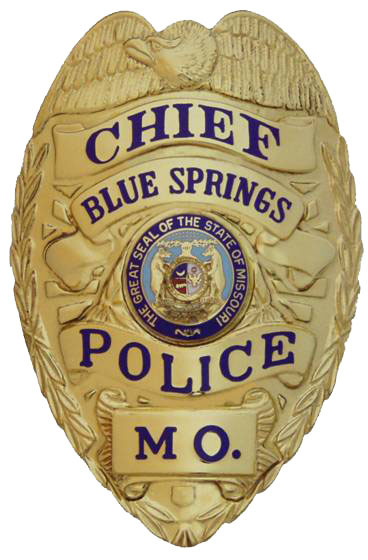 Upon completion of the four hour seminar and the minimum CPTED standards, managers and owners are granted the use of display signs on the property and use of the Blue Springs Police Department's program logo in all advertisements. If you have questions or need any assistance regarding the Crime-Free program, please call the Blue Springs Police Department Crime Prevention Unit at (816) 228-0178. We will be glad to help in any way possible. It is my pleasure to welcome you to the July 2010 edition of the Police Department's electronic newsletter, BSPD Mission Possible. Our goal is to provide you with the most up-to-date information related to our organizational activities and progress. In this issue, you'll read how the City Capital Improvement budget will improve our technology to help us do our jobs better, and see several instances of customer service and good police work. Cats (like Lightning and Thunder, pictured below) are a popular pet, so our Animal Control provides thoughts on cat care. You can read about out successful first ever Youth Police Academy, and meet Officer Richard Dec.
BSPD is committed to helping minimize the risk of crime and encouraging citizen involvement in maintaining the safety of our community. I hope that you will partner with us to make Blue Springs the safest it can be. Improved Technology on the way for BSPD! 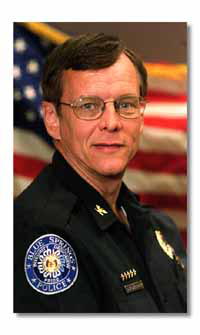 On June 21, 2010, the Blue Springs City Council and Administration demonstrated their commitment to providing public safety technology for our community with the rollout of the "Code Red" emergency notification system, as well as approvals for Mobile Data Terminals (MDT) and Automated License Plate Recognition system made during the annual Capital Improvement Program budget (CIP). The Code Red system - which received an all-call test at 1:00 p.m. on July 8th, 2010 - is designed for BSPD and the Central Jackson County Fire District to alert residents in a specific area of an emergency quickly. For example, if police are looking for a dangerous person in a residential area, we can immediately notify those in that area to be prepared and on the alert for any suspicious people. Additionally, residents may "opt-in" to receive emergency weather notifications. 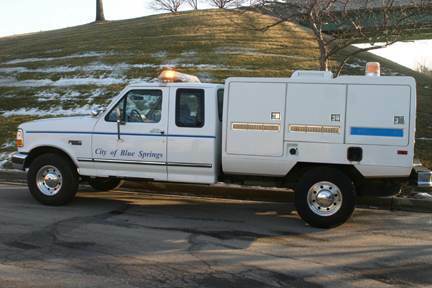 Please go to the city website at www.bluespringsgov.com for further information. 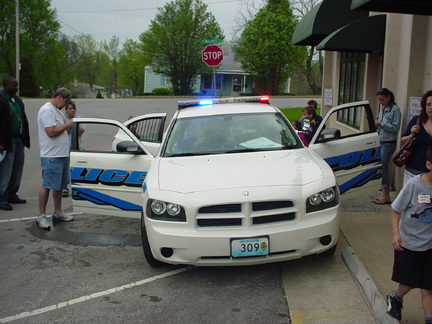 The 2010-11 Blue Springs CIP will include MDT's for Blue Springs police cars. These computer terminals in the patrol cars will allow officers to remain on the street while completing report documentation, meaning that they are available for quicker emergency response. Officers can access records more quickly, meaning that at a traffic stop or other contact, motorists can get back on their way sooner. At the same time, the system will allow location of a vehicle by other Officers when help may be needed, and prevent an overload of radio traffic from blocking a call for backup. The budget also includes the addition of automated license plate reader technology for two vehicles. This item constantly (without the Officer being taken from other tasks) automatically looks for license plates that are wanted because of being stolen vehicles or because they have been used in a crime. This is a very efficient and important function - criminals often use a stolen car while committing other crimes, as it is then harder to track them when they are seen by witnesses - the computer will automatically notify the officer when a stolen car license plate is near the officer. In the future, BSPD will need to address a federal FCC mandate for 2013 to upgrade our communications system. This technology will not only be needed to meet Federal guidelines, but will be needed to continue to provide the prompt, efficient response for which BSPD is known. It is important for our citizens to know that the police administration, city officials, and city council are working to ensure that technology we strive to obtain is beneficial in providing faster, more productive service in a that preserves resources allocated for our use. BSPD 1st Youth Academy Graduates! Youth as well as adults can now be involved in the BSPD citizen academies. and they come away with a new understanding of the police-community partnership. 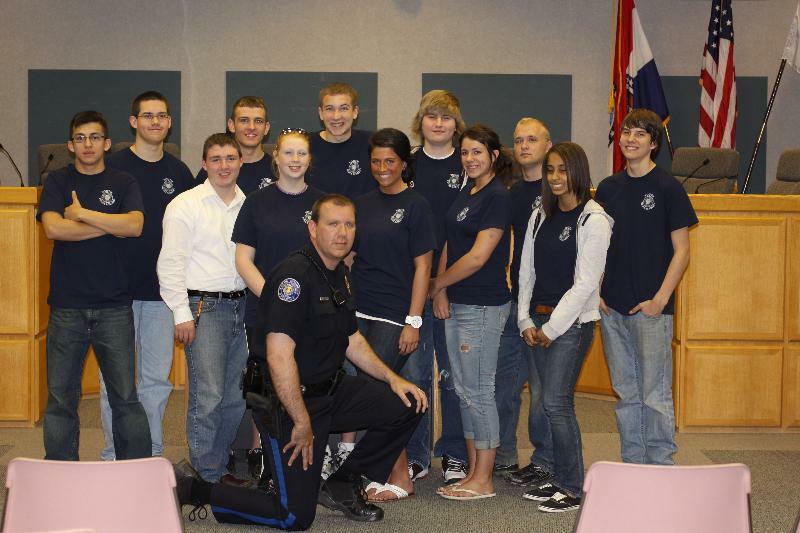 Milestones were reached in May, 2010 with the graduations of the 6th Blue Springs Police Department Citizen Police Academy on May 13, 2010 and our 1st ever Youth Academy on May 11, 2010. Both ceremonies were held at the Howard L. Brown Public Safety Building, with 19 adults and 17 youth graduating respectively. The BSPD Youth Academy, a shortened version of the adult academy, lasts for five weeks. The Youth Academy is designed to give youth from 14 years old up to those in their senior year of high school the opportunity to see the realities of police work and obtain behind the scene information into the life of Police Officers. Blue Springs Police Department Citizen and Youth Academies are ongoing; if you are interested in participating in a future class, call Sgt. Allen Kintz at 816-228-0178 or send an e-mail to the police department at police@bluespringsgov.com. Cats of all ages need care to become great pets. Cats evoke strong emotions in people; love them or not . . . cats are here to stay. Their companionship can be a wonderful supportive force for many people, adding a positive aspect to quality of life. In today's fast paced society, cats can be a good pet for a busy family. Blue Springs Animal Control would like to remind our citizens that cats have many of the same needs as dogs: wholesome food, fresh water and shelter, preferably indoors where it's warm. Remember, cats were originally desert animals. These fascinating animals need veterinary care, yearly vaccinations against rabies virus and a rabies tag affixed to their collar. Leash laws that pertain to dogs also apply to cats. Leash laws prevent unwanted litters and protect animals and people alike. Low-cost spay and neuter services are provided by local veterinarians, Humane Society and other not-for-profit organizations. Cats that are altered are less likely to wander away from home, fight other cats, yowl and disturb the peace or even be abandoned and killed. 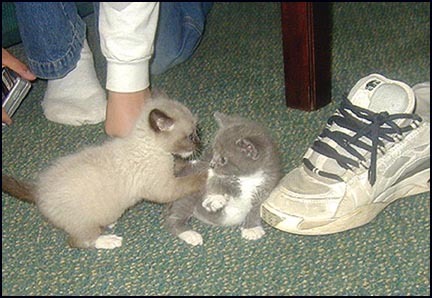 Cats can live for up to twenty years, so a lot of unwanted litters could occur in that length of time. With animal shelters overwhelmed by too many stray dogs and cats, and when their budgets are tightened during difficult economic times, the Blue Springs Animal Control Unit reminds you to follow these simple guidelines and be courteous to your neighbors. Let's treat our felines with fairness and keep all our Blue Springs house cats healthy, happy and home where it's safe. The Blue Springs Animal Control Unit (816-228-0149) welcomes calls for information or assistance. Our three full-time Animal Control Officers will be glad to assist you with more detailed information regarding keeping pets safe. Please don't hesitate to call; we will do our best to answer all of your pet questions. Mayor Ross and I were appreciative of a recent case solved by Detective Jeremy Dickstein that resulted in an arrest of a suspect in a high value theft from an auto in June, even though no one saw the theft occur. Through the use of parking lot video, area interviews, intelligence information and good old fashioned diligence, Detective Dickstein solved the case and recovered valuable property for the victim. We are proud of Jeremy and our Detective Unit efforts! Is has been my pleasure to bring you the latest news in Blue Springs public safety. During each new issue of the Mission Possible newsletter, this section will be used for comments we have received from you, our citizens, recognizing the customer service efforts of our Blue Springs Police Department. Staff Sergeant Retired Thomas E. Lewis stopped by to compliment BSPD Traffic Officer William Ely. After a medical incident, the family car had gone over the curb at 40 Highway near 15th Street, down into the ditch on its side. Officer Ely arrived on the scene to help keep everyone calm until Mr. Lewis could arrive to be with the family. 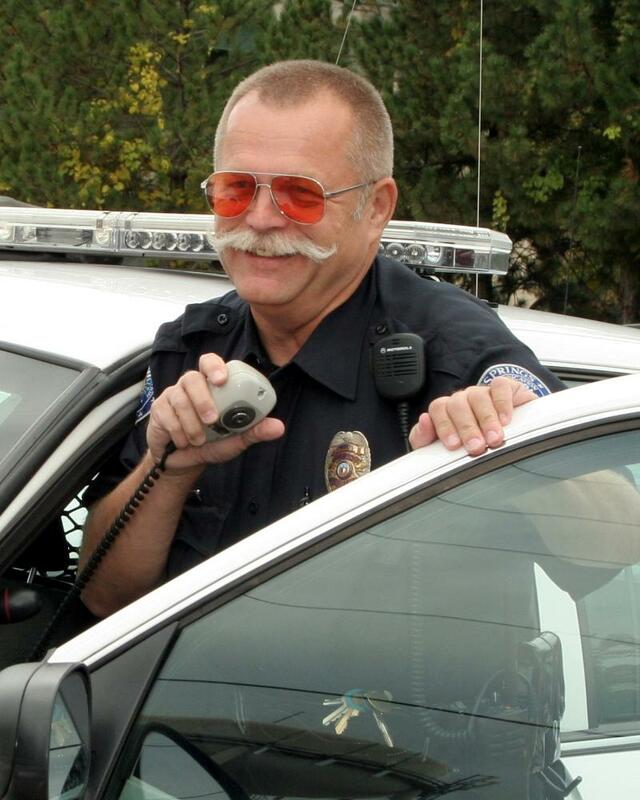 Mr. Lewis stated: "Officer Ely did an outstanding job of taking care of my wife and grandchildren before I got there. He transported everyone in his patrol car and didn't make them walk on the roadway. Officer Ely also helped me get everyone into my vehicle. Officer Ely went above and beyond as far as I am concerned." -Staff Sergeant Thomas E. Lewis, ret. Blue Springs, Mo. – The City of Blue Springs has earned a place on MONEY Magazine’s, “Best Places to Live” list, which ranks America’s best small cities in 2010. Blue Springs, ranked 49th out of a total of 100 cities recognized. MONEY Magazine partnered with OnBoard Informatics, a New York-based provider of real estate analysis, to select cities with a population of 50,000 to 300,000. The initial list consisted of 746 candidate cities; the selections were then narrowed by looking at housing affordability, school quality, arts and leisure, safety, health care, diversity and several ease-of-living criteria. In the report, Blue Springs was praised for its low cost of living, nationally-recognized schools, low tax rates and a central location among other things. Mayor Ross continued, “Our residents recognize the high quality of life that is offered through our affordable homes, beautiful neighborhoods and excellent community partners like the highly acclaimed Blue Springs School District”. “It speaks well to the hard work and commitment of city staff and the residents of Blue Springs. A high standard has been set and the City looks forward to distinguishing itself as an excellent place to live and work,” said Blue Springs City Administrator Eric Johnson. For more information about MONEY Magazine’s 2010 “Best Places to Live” list, visit http://money.cnn.com/magazines/moneymag/bplive/2010/index.html. Click more below to read entire press release! Dragons Booster Club looking for your support. The Dragons Booster Club, where our daughter, Katie Garten, competes in gymnastics, is participating in the Football Gold fundraiser to help raise money for our organization. I am asking you to consider helping us out by making a donation. When you make an online donation, you will receive a Football Gold ticket which provides you with a chance to win cash prizes based on the the outcome of NFL games in the upcoming season. The suggested donation for a ticket is 20 and our organization keeps a majority of the donation. I would really appreciate it if you could help us out. When you click the link below, you will be directed to FundraisingGold.com and from there will be directed to PayPal to make your donation online. After making an online donation you will receive an email confirming your donation and included in that email will be a link allowing you to choose your game card. During the NFL Season, points will be awarded to your game card based on the scores of the assigned teams or players. Your game card will be compared to the other game cards in your group and depending on how your game card scores, you may win a cash prize. This is a great opportunity for you to help out some very deserving kids and it's fun for you too. If you have any question about the program or about Fundraising Gold, you can visit their website at www.FundraisingGold.com or you can reply back to me and I'll try to answer your questions.